Shall you pledge allegiance to the Lion, Wolf, or Ram? Paris – May 28, 2013 – Cyanide today released official concept art and 3D renderings on the first three factions available at the launch of its multiplayer free-to-play game, Dogs of War Online, inspired by Rackham’s Confrontation miniatures game expansion. The knights of the Lion army, the fierce wolves of the Wolfen army, and the undead terrors of the Ram army will be present at roll call in Q3 2013! 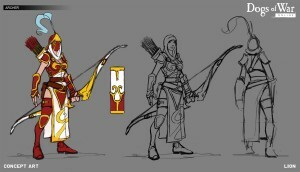 The Barhan soldiers of the great kingdom of Alahan are the defenders of Virtue, Justice, and Light. Each day, their army fights against those who seek to enslave the inhabitants of Aarklash. Its emblem, the Lion, represents the memory of its divine ally, the Chimera, and for the qualities the legendary animal stands for: strength, courage, and nobility. On the battlefield, the Barhans are brave fighters, inspired by the feats of their ancestors. Their book of spells draws from the forces of the Elements and their knights, who are the dauntless heirs of tradition, never waver when charging at the enemy. Each battle waged by the Barhans is proof that with a valiant heart, nothing is impossible! Whether roaming the wild lands or defending their territories, the Wolfen, half-man, half-wolf predators, instill fear into the heart of their enemy. Born to counter the unwavering ambitions of the Craftsman, the god who sought to overthrow order, they are the protectors of nature and the keepers of the balance of Creation. On the battlefield, the Wolfen are formidable fighters, guided by their predatory instinct. With deadly claws and fangs, they possess no need for clever tricks, but may resort to crude weapons made of stone, wood, and bone when faced with the technologically advanced arsenal of other nations. The Wolfen worship the moon goddess Yllia, whom they consider their creator, and they revere the constellation of the Wolf. A wave of un-dead, herded by lords reawakened from the grave, along with corrupt-minded living leaders make up the army of Acheron in all its macabre splendor. This army has its fearsome troops and the hunger for power driving the master necromancers at its side. With the Ram as its emblem, the symbol of the eternal alliance binding them to the horned lords of the Abyss, Acheron builds its strength century after century. All that matters to the liches and the necromancers who form the elite is the accumulation of power and knowledge, which feed their perversion. And the living who remain can only await their inevitable fate to be plucked from the dead as the elite’s most useful servants. Different types of fighters will be available in each of the three factions, allowing players to create a group of mercenaries suited to the desired level and style of play. Players are then tasked with implementing arena combat strategy. Battles employ turn-based combat to reinforce the tactical aspect and maintain the spirit of the board game. The adventure continues when players are tasked with sending troops on missions, alone or in co-op mode with other players, to increase reward. Finally, players are tasked with maintaining harmony within their army as troops are prone to deserting and raising tension amongst themselves! Dogs of War Online will satisfy both fans of the Confrontation license as well as fans of all strategy games. The game will be available for free on Windows PCs in Q3 2013. The studio is best known for its Pro Cycling Manager series. Cyanide also boasts games drawn from a wide variety of universes including Blood Bowl (sport/fantasy/RTS, 2009/2010/2012), Game of Thrones (Action/RPG, 2012), and Of Orcs and Men (Action/RPG, 2012, in collaboration with Spiders).